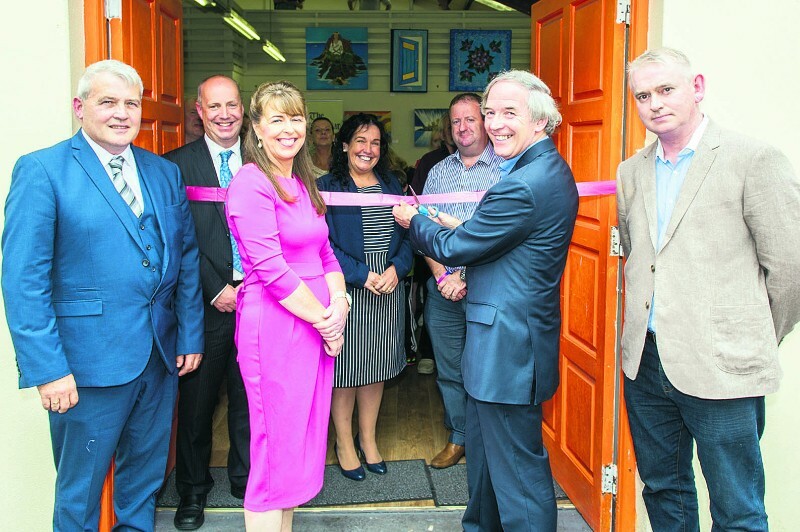 THE new offices of Lisheens House Suicide Prevention Centre were officially opened in Skibbereen. The centre, which will house counselling, education, training and support services, is located in the former print room of The Southern Star offices. With communication being key to good counselling, the building’s past, also being connected with communication, was mentioned by a number of speakers, including former Mountjoy governor John Lonergan, who opened the event. 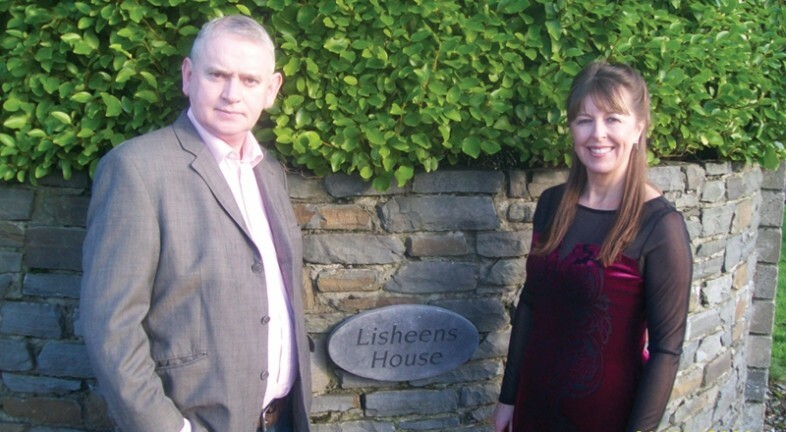 Lisheens was co-founded by Bantry woman Noreen Murphy, who lost her own husband to suicide some years ago, and Mick Kearns from Dunmanway. It is modelled on a similar service in Wexford – Talk to Tom – which was set up by Ray Cullen who also spoke at last Friday’s opening. A number of other services across the country, using the same model of counselling through education and support, are currently being rolled out. 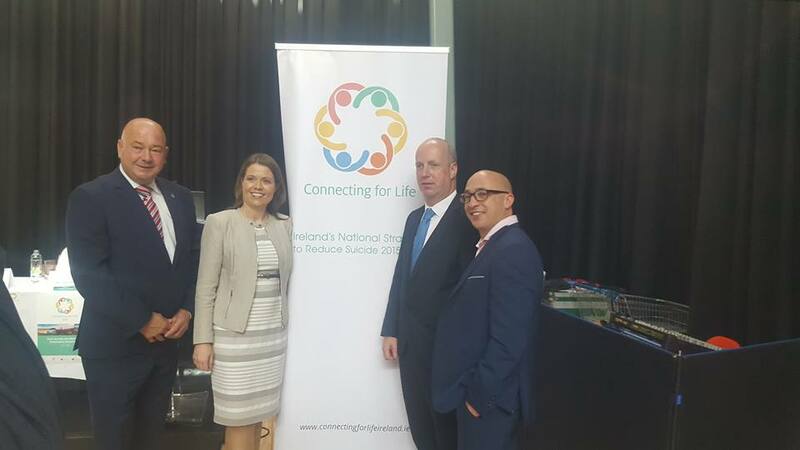 The service, which currently receives no government funding, was promised the full backing of West Cork’s three sitting TDs, who all attended the event. He added that he ‘sincerely hoped’ he would be able to secure funding for Lisheens, and that his Dail colleagues would join him in that endeavour. ‘We will be your voice in Dublin,’ he said. 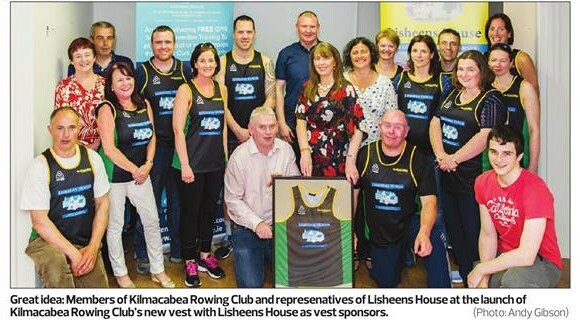 He added that Skibbereen now had a ‘hat-trick’ of community-up achievements – from the Ludgate hub, to the Skibbereen rowers, to Lisheens House. From the moment he arrived at the offices, he felt ‘warmth and a great welcome’, and he was delighted to see that a room which had allowed so many people to air their views in the past – through the newspaper’s pages – was now another forum for people to express their feelings. Dunmanway native Mick Kearns said Lisheens was borne out of tragedy in Noreen’s own family, but now something positive was being created. 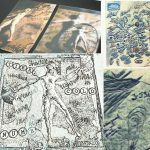 ‘We live in a very beautiful place here in West Cork, but none of us is immune from the tragedies of life,’ said Mick, who thanked Sean Mahon of The Southern Star for the space to begin ‘a new chapter’ in the print room’s life. ‘This is a non-judgemental, strictly confidential service,’ said Mick, and he thanked the people of West Cork who helped fundraise for it. 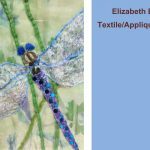 at her kitchen table, through her own personal tragedy. ‘We need to break the taboo and stigma that surrounds mental health,’ she said, and said there needed to be more support for people suffering, and also for the families and children of those who live with people with mental health issues. ‘We want to give people the time and tools to get on with their lives and live them to the full,’ she said. ‘Thank you all for believing in my vision,’ she added. Sean Mahon of The Southern Star said the service was ‘important and vital’ and hoped the stigma of mental health was beginning to go, thanks in part to places like Lisheens, and he offered continued support to the service. 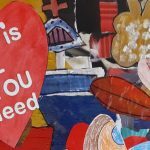 Rev John Ardis said that through his work he comes into contact with a lot of people who have mental health issues, and that it was great to now be able to refer them to ‘this very welcoming space’. Deputy Margaret Murphy O’Mahony (FF) said there was a ‘feelgood factor’ in the building and it was great that people no longer had to travel to the city for support. ‘Jim, Michael (Collins) and myself will lobby very hard for funding for this,’ she said. Deputy Collins said he was ‘not a bit shocked’ that there was no government funds for Lisheens because mental health needed to be treated by the government ‘the same as any other health issue’ and currently that was not the case. He said that ever since his election, he wears a ‘take care, help is there’ wristband and he congratulated Mick and Noreen on their work to date. 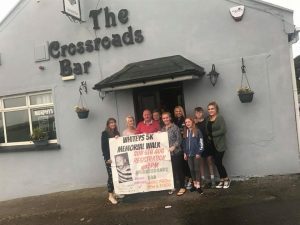 Ray Cullen of Talk to Tom in Wexford described his own battles with depression after a debilitating accident many years ago, and the death of his nephew through suicide. Although just a few years in operation, his organisation has trained 2,500 people without any government funding and he hoped Lisheens would adopt a similar model. John Lonergan, who cut the ribbon to officially open the offices, reminded people to be good to themselves and banish the negativity. 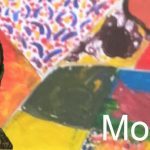 Listening is a huge gift to bestow on others, he said, and he never met an ‘all-bad’ person, even in all his years working in Mountjoy prison, so there is good to be found in everyone. He jokingly told Noreen Murphy not to worry about any debt that may be incurred in the future, because ‘when you are in debt, there is tremendous goodwill towards you! The worst thing that can happen Lisheens House is to have surplus money!’ he said. He said he hoped the name Southern Star would remain over the door because each and everyone passing through the doors was a ‘star’. Every achievement in the world began with someone saying: ‘I’ll give it a go’, he said, and we should ignore the old phrase that ‘self praise is no praise’ because we should all praise ourselves, and each other, every day. Speaking afterwards to The Southern Star, he said that modern life brought a strong sense of isolation and that in days gone by, people were much more like to ‘go visiting’ and have a social life. 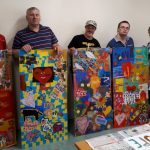 ‘Very often, there is no connection, no sense of belonging now,’ he said, so places like Lisheens should be encouraged and supported. OUR local TDs could not help but feel embarrassed when it emerged at the official opening of the new Lisheens House training and support centre at Ilen Street, Skibbereen, on Thursday afternoon of last week that it had been put in place without any government funding. Indeed, it was a reminder of the abysmal record of recent governments – the last administration in particular – when it came to funding for mental health services, which was very much the poor relation of the entire sector. All three Cork South West TDs – Michael Collins, Jim Daly and Margaret Murphy-O’Mahony – promised to lobby for funding for the valuable services being provided by Lisheens House in its efforts to prevent suicides in the first place, aid with recovery of those affected when it does happen and its general promotion of positive mental health. Founded by Noreen Murphy from the Bantry area, who lost her husband to suicide, and spearheaded by Dunmanway native Michael Kearns, Lisheens House provides counselling, education, training and support for people with mental health issues in its fabulous new centre, located in the former commercial printing area of The Southern Star in Skibbereen and which has a very welcoming and homely feel to it. It is indeed a credit to their selfless drive and enthusiasm and that of all the volunteers who gave so willingly of their time and talents to convert and equip the building. It was entirely paid for by fundraising and donations and, in officially opening the centre, the former governor of Mountjoy Prison, John Lonergan, homed in very much on the great voluntary community effort involved in the setting up and running of the centre. A strong sense of community, with everyone working for one another, provides a solid support structure for those in need of help and encouragement. The fact that such assistance is readily available in a locality should encourage people who need help in dealing with issues to seek it out and engage with the services offered. The Lisheens House confidential helpline is 023-8888888.